February 11th is the big night! 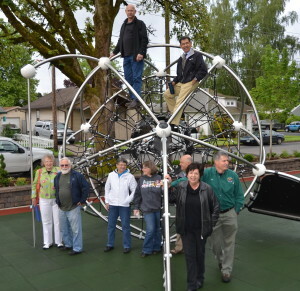 We’ll be celebrating the 80th anniversary of Newberg Noon Rotary! We were the 12th club in Oregon in 1936 and the first service club in Newberg. Join your fellow Rotarians on Thursday, February 11th at 6 pm at the Chehalem Cultural Center for a great evening. We’ll also be honoring 50 year member Leonard Attrell and 46 year member Ray Simonsen. 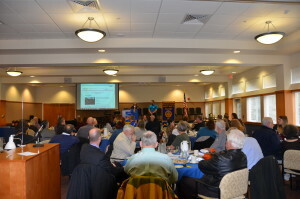 RSVP to http://signupschedule.com/noonrotary and we’ll have a sign up at club as well. It’s auction time and time for you to buy your Golden Tickets. You can contact Scott Karn skarn@FirstFedWeb.com or buy your tickets online from our website www.newbergrotary.org. You will have a 1 in 100 chance to have your choice of the live auction items which are pretty spectacular. Speaking of the auction, keep soliciting items for the event set for April 23rd. Again, go to the web site for more info as well as being the place to enter your solicitation. Also, talk to any member of the Auction Committee including the silent auction procurement team, Denise Bacon, Dawn McClard and Leah Griffith. I’m sure by now you’ve all read the article in the Newberg Graphic on our Nepal Mission Project, but here’s the link if you’d like to see it again. 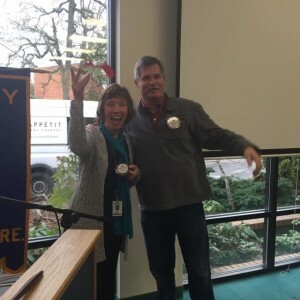 http://www.pamplinmedia.com/nbg/142-news/290501-167918-newberg-noon-rotary-reaches-out-to-nepal Also on February 10th, Rotarians Jenni Ferrell and Eric Bergquam will be the program and share their experiences as well as some of the over 1,000 pictures they took. It should be a fascinating program. We’re making plans for the club for 2016-17 and we’d like to hear from you for what you’d like to do next year. Thanks for those who have completed their survey. If you haven’t, please click here and just take a few minutes to tell us what you’d like to do with Rotary next year. https://www.surveymonkey.com/r/JCVMFS6. It was good to see Jan Winder again and she reminded everyone of an opportunity to join a Rotary Friendship Exchange to Croatia. 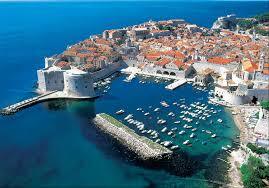 Our District will host Rotarians from District 1913 in Croatia from September 7-17, 2016 and District 5100 Rotarians will travel to Croatia in May, 2017. The teams from each District will be no more than 10 people. If you’d be interested in hosting or going to Croatia contact our District 5100 coordinator, Sherre Calouri at sherrec61@gmail.com. 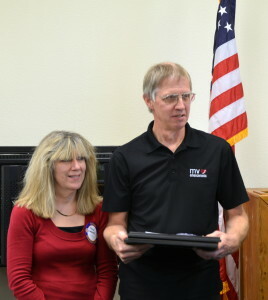 Lynn Montoya Quinn completed her new member requirements with her Classification Talk on Wednesday. She shared her background as a navy brat for her first few years and then she ended up in Pullman WA and Hood River OR for the remainder of her childhood. She decided early on that she wanted to be a Spanish speaking social worker in California and she made it happen as the first person in her family to attend college. She ended up in Arizona instead of California, but was working with kids, both in juvenile detention and also at a charter school, helping those kids get out of their troubled situations and live better lives. She moved to Portland in 1999 and started working at PCC and came to Newberg two years ago. She’d been watching the Newberg job and was excited when it came open. 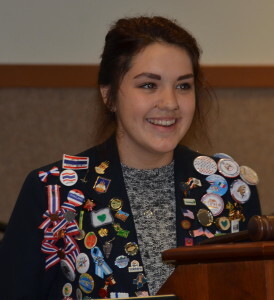 She jumped at the chance to be here and join in the community She’s ready to bring her background and skills to Rotary such as her fluency in Spanish, teaching, traveling and she makes the best Cowboy Cookies. We all decided she needed to offer an Auction Package of the Cookie of the Month with delivery of 2 dozen of your favorite cookies to your Newberg area business or home each month. I think that will get lots of bids! 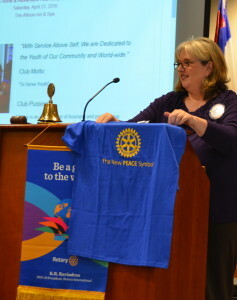 Welcome to Rotary Lynn and we’re looking forward to spending many hours in service to the community with you. Thanks FriendsView for your hospitality last week. It’s always nice to meet there. We had a busy meeting with lots going on. Jim McMaster was at a pool meeting so I had the pleasure of being upfront for the day. Lots of announcements and since Grant Gerke was back from travels and eating exotic food (raw geoduck) we had an Auction update. Start soliciting items! While we’ve sent out solicitation letters, don’t let that stop you from asking. If someone replies “I already got a letter” just say you wanted to add the personal touch! Think about asking at restaurants anywhere for a donation. It doesn’t have to be just Newberg, think about Portland, the coast, Bend and other places that we all travel to. Same thing with hotels, in fact we’ll be asking you to let us know those names, even if you can’t do the solicitation, if we can say Rotarians enjoy your hotel/restaurant in our team solicit, it can help. The Auction website is up and running. You’ll find it featured on our website at www.newbergrotary.org. You can buy dinner tickets, Golden Tickets and even make donations for the auction. Speaking of Golden Tickets… they are available online or directly from Scott Karn. Remember there are only 100 available and with those odds, your chances of winning are pretty good. If your number is picked you get your choice of the live auction items which vary in value from $800 to thousands. We were honored to induct Colby Strunk into Rotary. 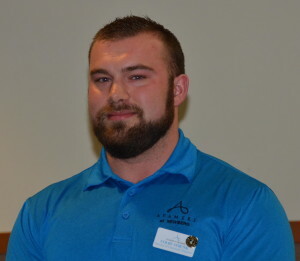 He works at Avemere and is looking forward to participating in a number of service projects. He’s been attending the last few meetings and so many of you have met him already, but if you haven’t look for the red ribbon and say hello. By the way, Ed Wanner is our other new members, so again look for those red ribbons and say welcome! Dave Parker reminded everyone that high school seniors should see their school counselors about the Rotary college scholarships. That’s a huge part of our Foundation and what we do for the community. If you know any seniors, encourage them to apply. 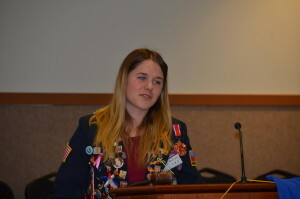 Suzanne Miller shared her recent experience at the Rotary Peace Conference in California. She and Mike Caruso attended and it was great to see hundreds of Rotarians looking at ways to seriously promote peace in our world. She shared the new Rotary peace symbol (on a tshirt). Newberg’s Youth Exchange. 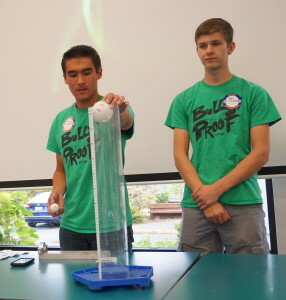 Newberg Clubs have more in and out bound students than any other club in District 5100.
well. Two of the students shared their experiences. I found pictures online of the Water Festival and it’s amazing how much water was tossed and shot on people of all ages! basically three days of people splashing and shooting each other with water guns. Thanks to Auggie Gonzales for the photos and Leah Griffith as editor. Remember we’re looking for volunteers to edit the newsletter next year. Guests included Danielle Issac, a prospective member and Colby Strunk, who will be inducted next week. Keep the evening of February 11th open as the club will be celebrating our 80th anniversary. Newberg Rotary was the first service club in Newberg and in 1936, 400 people came to the dinner when the charter was received. More info available next week. Jeff Lane announced the Pancake Breakfast committee is starting to meet. Be ready to flip those pancakes July 30th and 31st at the Old Fashioned Festival in Memorial Park. You can now sign up for Greeter duty on the web site at http://www.newbergrotary.org/join-us/meeting-information/. It’s a quick and easy way get signed up and being a greeter is great way to meet everyone in the club. The Martin Luther King Jr. Community Celebration is on Monday, January 18th at 5 pm at the Chehalem Cultural Center. Dr. Johnny Lake, distinguished speaker on unity and diversity, will be the main speaker as well as music and other commemoration activities. Our Peace Committee is part of the community planning group. It’s time for our weekly Wine & Adventure Auction update: Scott Karn has Golden Tickets for sale. For just $ 100 you can have a chance (1 in 100) to win your choice of the live auction items (most valued at $3,000+) Golden Ticket funds help support club activities. It is also time to start soliciting items for the auction. In Grant Gerke’s absence, Jeff Lane handed out lists of your last year solicitations so you can look at getting that item again this year or something new. Look at your own company and also where you shop. 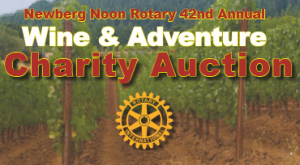 Remember to tell people that the auction allows Rotary to accomplish so much, such as literacy programs, foster kids camps, high school robotics, grad night, high school scholarships and many more local and international projects. The Auction website makes it easy to buy dinner tickets, Golden Tickets and even note the items you’ve solicited. 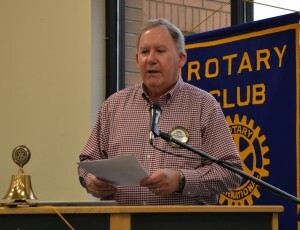 Spike Sumner, Newberg Rotary Club Foundation chair, presented the annual report to the club about our own Foundation. 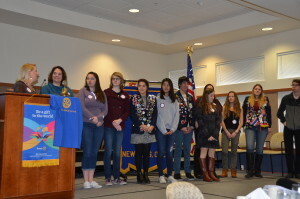 The purpose of the Newberg Rotary Foundation is to promote and encourage the health, education and general welfare of youth, principally in Newberg and the local area. The funding for the Foundation comes from the Auction, proceeds from the Rotadent project and income from investments. The Foundation has an endowment of over $600,000 that allows investment funds to be used every year and also provides a cushion in case the annual funding is a bit less a particular year. Our Foundation is one of the largest Rotary club foundations both because of the great support from Rotadent as well as all our efforts to make the annual Auction a success, so get those items solicited!!! 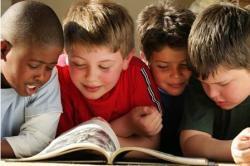 The Foundation distributes almost $200,000 a year in grants. At $40,000+, Rotary provides the most scholarships to Newberg High School seniors each year. Our Foundation usually funds services while the Early Bird Rotary Club usually supports capital projects. The Foundation accepts grant requests, but they would like the club to also be proactive and think of projects we should pursue. The Foundation was formed in March of 1974 with our own LeRoy Benham as a charter member. Currently Auggie Gonzales, Jim Hirte, Jeff Lane, Grant Gerke, Andrew Aylor and Spike serve on the Board. Each year two positions are open with Jeff and Grant the newest members of the Foundation Board. You can make a bequest or donation to our foundation, just talk to any member of the Foundation board. 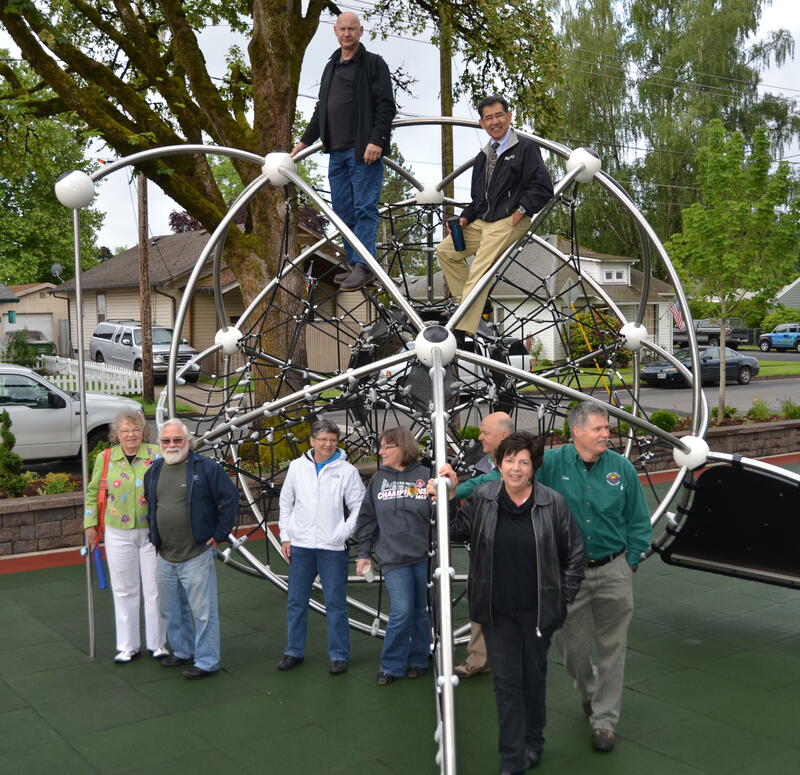 The Foundation has supported the building of playgrounds throughout Newberg, including Memorial Park. We met again after a two week break from meetings. It was great to connect with each other after the holidays. We welcomed prospective member Colby Strunk as a guest. 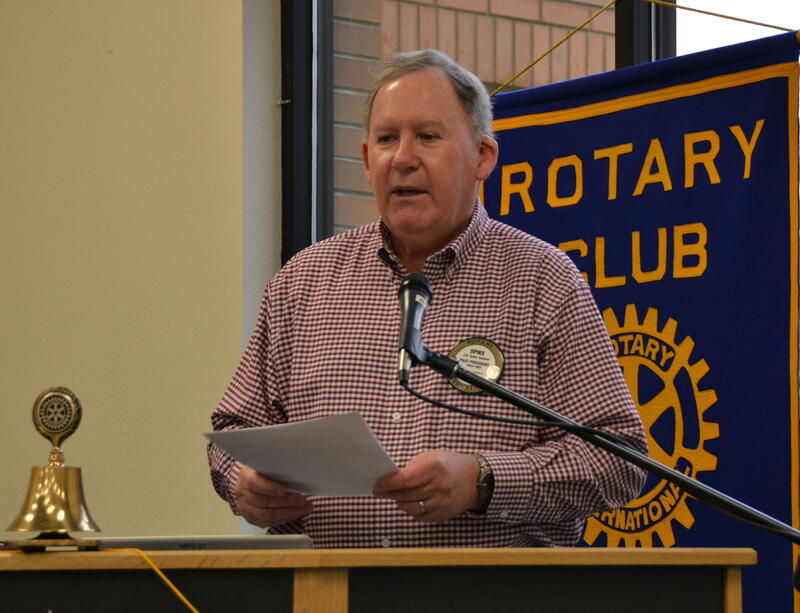 Grant Gerke joined us from his world travels in Austria, London and Australia in December to remind us of the upcoming Rotary Auction on April 23rd. The committee starts meeting this Thursday, January 7th at 4:30 at Adec. Mike Caruso and Suzanne Miller will be attending a Rotary Peace Conference in California next week which is a wonderful opportunity to pursue our peace efforts. Jack Maxwell III did the 4 Way Testimonial and talked about how he learned how being the recipient of a gift and service from others makes those giving the service feel wonderful as well. His fiancee joined up with a fellow Rotarian and others to make Jack’s dream of owning a motorcycle come true. He saw how happy it made Vicky to make this happen and he’s a lucky man. We finished up the day by sharing our holiday activities from trips to Disney, to kids and grandkids, payoff of a football bet, Exploding Kittens games, trips to Santa Fe, weddings, snow, digging with a backhoe, wandering cattle, elf costumes and serving at the homeless shelter. It was great to get to know each other a little better.